You can only store soulbound or account-bound items. Anything else you want to hold on to will have to stay in your bank. Any items deposited will be stripped of enchants, gems, sockets, and reforged stats. Though this may seem like an odd caveat, Blizzard says this significantly reduces the impact storing these items has on the game servers. You can’t store items unless they’re fully repaired. You can’t deposit stackable items. While you cannot presently transmogrify using items in void storage, in patch 5.3 you will be able to without any need to pull the item out of storage. This makes void storage an extra convenient place to keep items you want to use for transmogrification and nothing else. Need more storage? Consider a bank alt! 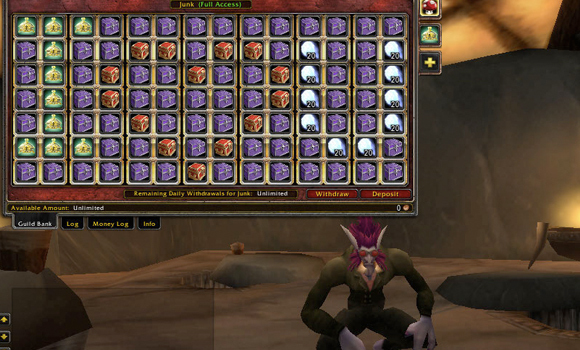 For players with serious inventory woes, a bank alt may be the way to go. A bank alt isn’t anything special — it’s just a new character you create on your server who exists primarily to give your main character access to another bank’s worth of storage. Once you’ve created this new character, just make a run for the nearest capital city and park it near the mailbox. Your main can send it bags and items you want to hold on to (but don’t have the storage space for), and you can store them in the bank of your bank alt. When you need the items you can just mail them back yourself. or Sell wow gold to us when you have unnecessary stock. A bank alt can also be a useful way to play the auction house. Because this alt is always in a capital city, it’s easy to mail things to it that you want to auction off — all without the trouble of making your way to an auction house yourself. When you need items or gold that your alt has, just mail them back to yourself — mail between characters on the same account arrives instantly, making transferring goods extra simple. If you find, after decking your bank alt out with bank slots and bags, that you still don’t have enough storage space it’s time to take extreme measures. Your bank alt can create its own guild which will then give you access to a guild bank’s worth of storage — which, trust us, is a lot. Starting your own guild for this purpose can be tricky, as you’ll need 4 people to sign your guild charter, but you can often get this by asking politely, being patient, and offering a bit of gold to sweeten the deal for other players. Not sure where to get started with your own guild? Hopefully these tips have you with all the storage space you can manage to use… and if not, well, you could always roll a second bank alt!